Learn more about Sue Thomas and scheduling her as a speaker. Leslie Basham: Sue Thomas was working a desk job at the FBI when she was called to the front office. Sue Thomas: There was only two reasons a person went to the front office: It was to be terminated from their job or to be interrogated by the FBI agent. Leslie: She didn’t realize there actually was a third reason: The FBI was about to unleash her special talent. This is Revive Our Hearts with Nancy DeMoss Wolgemuth, author of The Wonder of His Name, for November 28, 2017. Nancy DeMoss Wolgemuth: Yesterday, we began hearing the story of Sue Thomas. When she was just eighteen months old, Sue permanently lost her hearing. Thanks to supportive parents and a good coach, she learned to play the piano and ice skate. If you missed any of yesterday’s program, you’ll want to be sure and listen to it at ReviveOurHearts.com. It includes a beautiful rendition of "Silent Night" like none you’ve ever heard before sung by our guest who can’t hear any music. Let me also mention, she couldn’t hear me asking any questions. She read my lips through this entire interview. Sue Thomas says her academic career began to improve, thanks to one woman. Sue: She was my typing teacher. What I didn’t realize was that, when I entered her class, she had made a silent vow to herself that as each student who walked across her threshold, she was going to make them the fastest typist in the history of the typewriter. And just because I was deaf, it didn’t matter. She began to walk with me—slave over me. I started out at twelve words a minute, and then forty-eight, ninety-two, one-hundred-thirty. I whizzed all the way through it. And finally I maxed out at 198 words a minute. Nancy: Wait—198 words a minute? Sue: 198 words a minute. It was on an IBM Selectric. Nancy: I didn’t think that was possible. Sue: It was unbelievable! She knew something as a teacher that every teacher should have known—no dummy can be typing this fast. She believed in me, and she began to work with me, one on one, and through her life, I went to college. I just didn’t realize it would take me eight years to leave the place once I got there. But eight years finally passed, and I finally had that accomplished degree in my hand because of this one lady. So you see, I go back, and I share three lives, so very different from each other: the speech therapist, the skating coach, the typing teacher. So very, very different, and yet a common denominator is still the same: They gave it their all. They never wavered. They never gave up. And probably the most important of them all: They never saw the final results of their labor. Sue: That TV show, that’s where I must tell their story. When I stand on the platform, they stand with me. It’s not just me. It’s what God has used in the lives of other people. The lives will either make us or break us. Yes, God creates good and evil, all for His glory. And basically, people hush up at the bad things. Okay, God allows that? You betcha! Well, why? It shows the need for Jesus. If things are going good, we don’t have any need for God. But basically, when the going gets tough, who do we run to? Oh, God, help me! I’ve learned this. I’ve learned that every single second of my life is ordained by God, and whatever He brings for it is for His glory and for my good. There is no bad, no evil in my life with God. He uses it all. For all those times as a kid that I couldn’t understand, I had to search, to seek, to ask for knowledge that I might understand. And at the age of sixty-seven, I understand. I am free. And every single day I grow more deeply in love with Him. Nancy: We’re going to hear more about your journey, but I want to just stop and say that what you’ve just shared, I think will be a great encouragement to some people who are listening today who are parents or teachers, skating coaches, who are investing in the lives of children or young people. Maybe they have a physical disability, maybe they come from a background where they don’t have many privileges, maybe kids are making fun of them, but there are some people out there who are influencing these children, these teenagers, and I think your story says to them: Don’t give up. You may not see the fruit or the reward of your investment until a long time down the road, but God is at work in the lives of those that you are influencing. So this will be a great encouragement, I think, to many who are caring for or teaching or leading children who have different kinds of needs. And all children, all people have needs. And so, as we invest in them, we are being God’s instruments in the lives of those children and young people. Sue: If I’d never walked these paths, I would never have understood about the others. I would never be able to encourage them. Okay, basically they left me, they shunned me, but I made it, only because He was with me. And I now know, with anyone, I can weep with them. I can rejoice with them. I can encourage them. I’ve been there. I’ve done it. And if I can do it, you can do it. Only with Christ, you’re never nothing, but in Him you’re everything. Nancy: What did you study? What was your major in college? Sue: I was in Political Science. I was very interested in current events and economics. So even today I’m really in the politics, watching the world unravel the way it’s doing. I didn’t realize at that particular time that I would be entering into the field with the federal government. God was just planning that even before I knew that I was about to step in that area. Nancy: Your life is such a beautiful illustration of the sovereignty of God, His good and wise plan. I love hearing this. In fact, last night, before we came to have this interview, I was reading about your story. I was watching some videos where you have told your testimony. My husband had gone to bed, and I went in, and I said to him, “Honey, you have to listen to this.” So I kept him awake past his bedtime. Nancy: He was loving it with me, and we were just rejoicing. We prayed for you as we went to sleep last night because your story is such a powerful testimony of the amazing grace of God. Now, when you got out of college, you wanted to find a job, but it wasn’t very easy. Sue: No. There wasn’t one person that was willing to hire me. I couldn’t answer the phone. They were afraid because I was deaf, I wouldn’t understand, and I would make mistakes. I ended up going back to the same Speech Clinic that taught me to speak. I pounded on their door, asking for a job. I know they felt sorry for me. Why? They hired me even without a job. I was like a gopher, a jack-of-all-trades. I can remember some days of taking paper clips out of one box and sticking them in another closet. That was my job. But God was still writing the chapter on my life because I was a friend in the Speech Clinic who in turn had a friend that worked at the federal government who in turn had a friend who worked for the Department of State who in turn had a friend that worked for the FBI. Nancy: How does the Lord write those stories? That’s amazing! Nancy: And they came—you got the message that there might be a job for you at the FBI. Sue: What I didn’t realize is that they were looking for deaf people to start a new program to examine fingerprints. As I explain to people, all those funny lines on their fingertips are fingerprints, and no two people have the same. So they thought deaf people would come and search the fingerprints, and it would be a lot faster and a lot more detailed than having a hearing person do it, which was currently happening. You start looking at this print, and you have to count each one of those lines. Well, for a hearing person, in the middle of the count, if somebody sneezed, they would look up to see who sneezed, and they would have to start at the beginning and count again. Or if somebody dropped a book, they would have to find out what book was dropped, and they’d have to start all over and over. But there was some bright idea at the FBI that if they hired the deaf people, then people could sneeze, doors could slam, books could drop. They were deaf, they’d never hear it, so they would just keep counting. That’s the way it was. That wasn’t what God made me for, to count lines. I’m a people person. I love people. And that’s a whole other session about that. But while I was there counting the lines, one day my supervisor came to me and said that they wanted to see me in the front office. There was only two reasons a person went to the office: It was either to be terminated from their job or to be interrogated by the FBI agent. So I went to the front office very slowly that day, and when I walked in, there were nine men waiting for me. They told me to sit down, and they started asking me questions. And then they came to realize that they had a big problem. They were working on a case which they’d video filmed the suspect, but on this particular case, when the camera activated, the sound mechanism failed. So they had all this film with the bad guys talking, but they couldn’t hear him, and they wanted to know if I would watch it and write down any words. From that day on, I never went back to reading fingerprints. I read lips for the FBI. And to sum up my job, I followed the bad guys around, and I read their lips, and I told the good guys what the bad guys were saying. And they even paid me to do it, too! So that was a whole unique job. I became known as the secret weapon for the FBI. Nancy: Here you were having career success, and your life seemed to be going really well, but inside, things were not going well. Sue: All the outward signs were a lie. The happy-go-lucky, cheerful person—I lived the part for society. Inside, I was so defective. By the time I’m in college, I realized that I’m not just questioning my parents any longer. I’m basically realizing my parents made a mistake when they told me God never makes mistakes. I was convinced God had made a mistake. Nancy: By making you deaf. Sue: Because when God created me, He created me with a heart that absolutely loves people. I thrive on people. I love people. And in that same creation that loves people, He allowed the silence to overtake me. I am an expert lip reader. I can read your lips one on one. I’m even good—I can do two people. When there’s two people, it’s like watching tennis being played. They’ll talk, they’ll stop. They’ll talk, they’ll stop. They’ll talk, they’ll stop. I can do it. For every person you add into my mess, I deteriorate because somebody is going to say something, and by the time I find them, they’ve already said it, and they move on. I can’t do it. The very thing that I love, the very thing that I want, I can’t have. Nancy: Because you wanted to be with people. Sue: I wanted to be with people. When God created me, He created me with a very, very strong spirit. He knew that He had to, that I would endure the path of silence, the rejection, the loneliness. He knew that I would have to have the spirit that would endure. So He blessed me with that spirit. And what I’ve come to realize is that in the strength of that spirit, if it’s used for my will and my desire, it will be for total destruction for anyone around me, including myself. But if that strength is used for the glory of God, it can move mountains. I just had to learn this in my walk with Him for Him to teach me, but I had to hit rock bottom before I began to wise up. Nancy: And so you set out to find God. Sue: I set out to find God, and I ended up finding Him at Columbia Bible College and Seminary in Columbia, South Carolina. Nancy: But I think you went there for an unusual reason—you wanted to find God to show Him that He made a mistake. Sue: That He made a mistake. Yes. Most people go to Bible school either to learn the Scriptures or the Bible or be pastors or missionaries, all those reasons are okay in biblical proportion. My reason was not for any of that. It was for the sole reason of finding Him to make Him confess that He made a mistake. And He knew that I was coming. I think He was waiting for me because He didn’t just have one person be my friend. He stuck me with twenty people—twenty people! He knew I couldn’t do it. But that’s what He had for the army, for me to face. Nancy: So that was, twenty people in your class—right? Sue: Twenty people, that was just my class. We forged as a team. We ate meals together. We studied together. When we were in class, we sang together. We laughed. I was with those twenty people. I laughed with them. I faked it because when I would go back to my apartment, everything within my reach, I tightly struck with anger. So many times I cried out to God, “Please give me my hearing.” It was always the same answer: Silence. Nancy: Now, when you got to the seminary, you told a friend at school something that wasn’t true. Nancy: What did you say? Sue: I vowed, if God wasn’t about to change my pain, I would take matters into my own hands. I went to one of my friends of that twenty, and I told her a lie. I told her that I had a terminal illness, that I was dying. How could you? Why would you? Because of my perverted thinking. I thought, if she believed me, she would want to spend as much time with me, one on one. And my thinking was right. That’s exactly what happened. But I didn’t realize in the split second that I told that lie that it would last for over seven months. And I had no idea that the first person that I told that lie would fan out to not only the twenty people in my group, but it would go out to the entire school. And surely I had no idea that that lie would totally consume me and destroy me. The school was praying for healing. But we have a God that knows all, that sees all, that hears all. And He knew that I didn’t need no physical healing. Nancy: So you had told the student, and who told—everybody heard—that you were dying of a terminal illness. Sue: I told that one, that fanned out to the twenty, the twenty told, and it was just going out when my advisor at school knew, the professors knew. They were praying. Nancy: Praying that God would heal you. That next morning I met with my advisor. I told the truth, that it had all been a lie. Tears were streaming down my face. I knew that I would have to go to the twenty different people to tell them the truth, and I was ready to do so. But what I didn’t know was I would have to stand before the entire academic committee. The night before I was to meet the committee was the longest, darkest, quietest night of my life. The shame was unbearable. I couldn’t face them. I got my suitcase out and began to pack my bags to run away. As I was packing, my Bible fell on the floor, and it fell open. I reached down, and I just picked it up open, and I put it on my lap. I sat on my bed, and I looked at it. Then I looked down again, and I’m in the book of Hosea. And, Nancy, at that time in my life, I didn’t even know there was a Hosea in the Bible. That’s been over thirty years since I came to the foot of the cross. And I have seen His promise kept in every way. But the last verse, His anger has been gone from me. I see His love every single day. My foot has not been moved. And when I’m out in the world, people often say, “Oh, you’re so beautiful.” Now, you think, Friends say that, but this hunk of clay, how can they say that? Then He always has me stopped dead in my tracks when He reminds me that He promised me that I would blossom like a lily. And the people that say that, can see Him. Each one of those persons He has promised, and I have vowed that I will see the day for the last person to be fulfilled, that my people shall return from exile far away and will rest beneath the shadow. The promise was so overpowering that I went on the floor, flat, faced down, cried out for mercy, and told Him that I could not walk the path that He had so chosen, that it was unbearable, that I couldn’t do it, that I didn’t want to live, but if this is what He had for me, He had to live in me. He had to do it. That night, in the dark, I totally surrendered my life to Christ. I totally came to Him in my shame. Nancy: That’s Sue Thomas. She’s been telling us about some of the intense challenges she had growing up after losing her hearing at just eighteen months of age. She was reading my lips during this interview. But Sue realized that she had a far greater need than her physical hearing. She needed to be forgiven of her sin and connected with God. That need was met through Jesus Christ. Now, I’m sure that the details of your story are different than those of Sue Thomas, but as was with the case with Sue, we’ve all made decisions that we regret that hurt other people. And today, perhaps, as Sue has shared in her story, you’re ready to put your faith in Jesus Christ to forgive your sin and to give you a new life. We’d like to send you some free information if you’d like to make that exchange and find true freedom in Christ. Give us a call at 1–800–569–5959, and ask for the information about knowing Jesus personally. Now, as we often share, we are able to bring you Revive Our Hearts programs like this one, and to send free information to new believers, thanks to listeners who believe in this ministry and who support this program with their financial gifts. 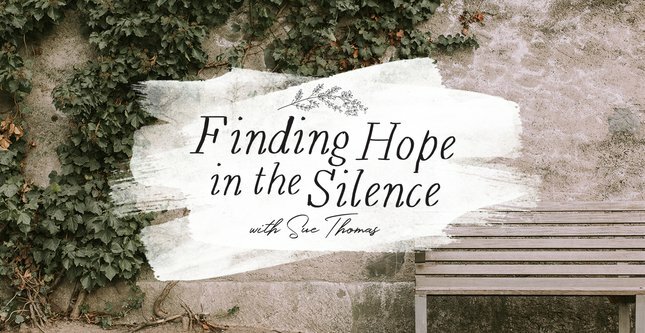 Only the Lord knows how many deeply discouraged people have tuned into the story of Sue Thomas this week and heard about how they can find true hope. When you support Revive Our Hearts, you become part of sharing that hope in Christ. And when you send a gift of any size this week, we’d like to say “thank you” by sending you the brand new 2018 Revive Our Hearts wall calendar. The theme of this year’s calendar is, “The Truth That Sets Us Free.” And this particular calendar was designed by a young woman who actually grew up as a staff kid in Revive Our Hearts. I’ve known her since she was a little girl, and what a joy it is to see her developing these amazing artistic gifts and using them to serve the Lord and others as well. So when you get this calendar, each month of the year you’ll be able to turn to a new page and read a quote about God’s truth presented in beautiful calligraphy and water color. The only place you can get this wall calendar is from Revive Our Hearts. So call us at 1–800–569–5959. Make a donation of any amount, and be sure to ask for the calendar when you do, or visit us at ReviveOurHearts.com. And when you go to our website, be sure to watch the video from Sue Thomas in our studio. After years of struggling to accept her deafness as a gift, Sue Thomas was hit with a second major health challenge. Hear how she reacted when she was diagnosed with MS. That’s tomorrow on Revive Our Hearts. Revive Our Hearts with Nancy DeMoss Wolgemuth wants to help you thrive even in tough environments. It’s an outreach of Life Action Ministries. Next Program Haven’t I Suffered Enough?